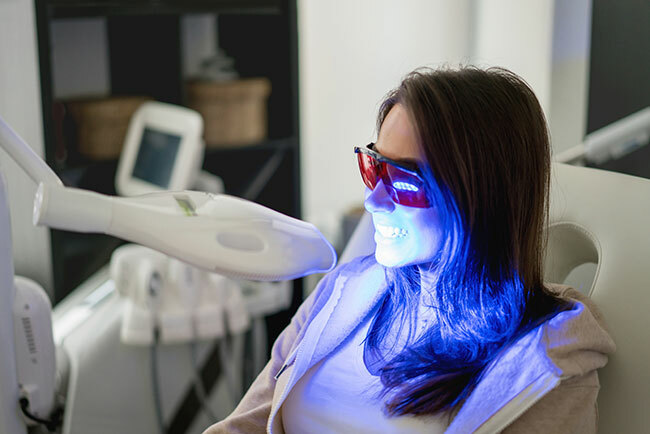 What is Blue LED Light Teeth Whitening? An often overlooked part of looking our best is our teeth. Our teeth are an important part of how we look. A brighter, whiter smile, helps us feel healthier and look younger. Midtown Med Spa offers a state-of-the-art LED light technology to help whiten your teeth in minutes, without the feeling of any insensitivity. Our teeth whitening technology exposes your teeth to blue LED light, helping to whiten your teeth faster. Q. Is Blue LED Light Teeth Whitening safe? A. Yes. Extensive research and clinical studies have found that it is safe. Q. How long does one Teeth Whitening treatment take? A. One treatment requires 20 minutes and provides noticeable, instant results. Q. How often do you recommend me getting a Blue LED Light Teeth Whitening treatment? A. Midtown Med Spa recommends treatment intervals of six months. Q. Will Blue LED Light Teeth Whitening cause me any sensitivity? A. Midtown Med Spa’s Teeth Whitening treatment does not usually cause any sensitivity. In rare cases, any sensitivity felt will be mild.